New Way Balance Bearings are externally pressurized air bearings offering non-contact support of rotors for balance machines. Like all of our products, balance bearings are built on the same foundational Porous Media TechnologyTM. Through this technology, balance bearings utilize air to provide a stiff gap, enabling a frictionless solution with a more precise axis of rotation. As an adaptation of New Way radial air bearings, balance bearings are able to provide an improvement in precision when compared to traditional roller bearing balance machines. Our unique air bearing design also allows for an overall decrease in maintenance downtime allowing for higher productivity in balance operations. With balance bearings, the roundness of the journal (often .0001 of an inch or better) is the only rotating reference surface. Motion errors will be synchronous and averaged, presenting a clean signal that is exactly the same each revolution, allowing for a finer resolution in balancing. This is a key differentiating feature when compared to roller bearings which impart vibration during balance machine operations. Axial force errors are also removed with the use of balance bearings. A rotor supported on roller bearings exhibits some axial forces from misalignments of the rollers. Unbalanced forces change because of the nature of the rollers, resulting in changes in the axial force. While these changes are likely to be almost synchronous, they may still be out of phase enough to obscure balance resolution. The non-contact nature of the balance bearings eliminate damage to the rotor from hard rollers. This avoids downtime to replace rollers, not to mention the downtime required for periodic lubrication. Our unique ‘snap-joint’ attachment allows a streamlined turnover between rotor sizes, allowing for increased balanced operations. 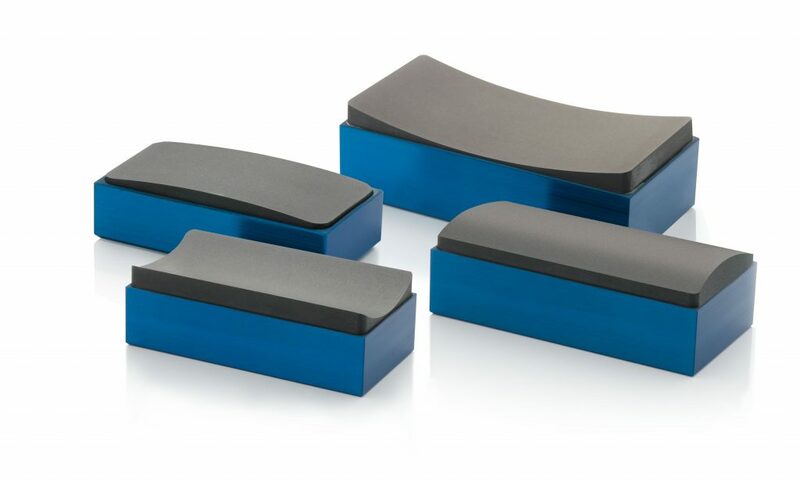 Balance bearings can be used in hard or soft-balancing machines and in low or high-speed operations. They are ideal for high-speed operations as there is no concern of thermal impacts on a lubricant. They are also ideal for vacuum chamber balancing operations where oil film bearings create a mess. Balance bearings are a result of a combination of New Way radial air bearings paired with a unique snap joint. 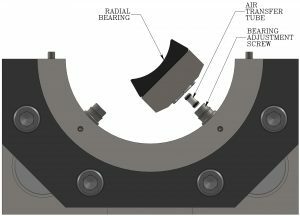 New Way radial air bearings provide stable support rotating artifacts on a thin, yet stiff, layer of air, allowing for surface speeds of up to 100 meters-per-second. They are designed to ride on the outer or inner diameter of a rotating artifact, using concave and convex shapes. A radius cut is made along the length (L) or width (W) of the bearing, depending on your structural requirements. The bearings are specifically machined to the tight tolerances necessary to create non-contact motion. The snap-joint allows for bearing pads of varying sizes to ‘snap-on’ and ‘snap-off’ allowing the balance machine operator to easily balance rotors with different journal sizes without having to adjust or plumb air into bearings. Balance bearings can also be retrofit with existing low speed balance machines through the use of our “bolt-on” adaptive hardware.This adaptive hardware is also compatible with New Way’s gas bearing hardware. 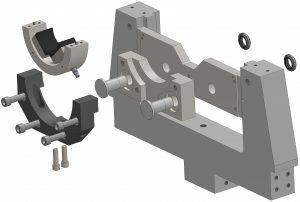 In the image shown below, the balancing machine yoke is shown on the right hand side, and New Way’s adaptive hardware and gas bearings are shown on the left hand side. The adaptive hardware uses the same mounting features as the original hard rollers. New Way works directly with customers to produce a balance bearing utilizing these components and the customer’s specifications. Take the next step to improve the measuring process in your balance machine and tell us more about your balance machine application! We are ready to help improve your balance machine operations resulting in a better end product. These bearings are offered in a variety of custom sizes, contact New Way Air Bearings for more information. These are just a few examples of applications well-suited for the use of balance bearings in a balance machine. Tell us more about your balance machine application so we can start bringing harmony to your operations! Contact us for a complimentary consultation to learn more about balance bearings!